The 2007-P Jamestown Commemorative Proof Silver Dollar was released by the US Mint in 2007 to help celebrate the founding of Jamestown in 1607. 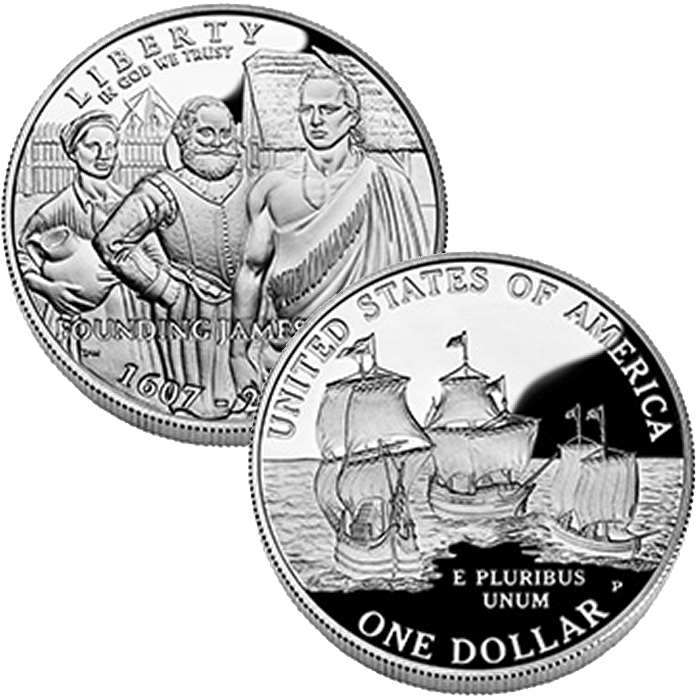 Authorized by the Jamestown 400th Anniversary Commemorative Coin Act of 2004 (Public Law 108-289), these silver proof coins were joined by uncirculated versions of the same design and two gold coins – all of which feature designs recalling the first permanent settlement of Europeans on land that would one day become the United States of America. Each Jamestown Silver Dollar is struck from 90% silver to the typical 1.5 inch diameter. The US Mint released the Jamestown Proof Silver Dollar on January 7, 2007. Initial price on the Proof Jamestown Coin was $39.00. The Silver Jamestown Coins were struck at the US Mint’s facility in Philadelphia and feature the ‘P’ mintmark. Designed by United States Mint Sculptor-Engraver Donna Weaver and sculpted by Don Everhart, the obverse (heads side) shows three diverse individuals indicative of those who had to work together to ensure the success of the colony. 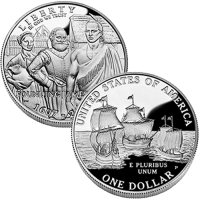 The reverse was designed by United States Mint AIP Master Designer Susan Gamble and sculpted by United States Mint Sculptor-Engraver Charles Vickers and shows the three ships which carried the colonists to Jamestown – the Susan Constant, the Godspeed and the Discovery.